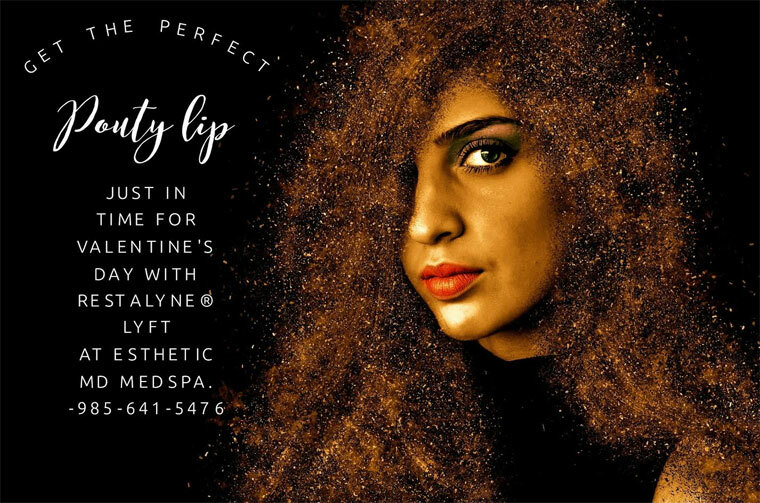 Give the gift of relaxation & beauty this Valentine's Day! Nothing says I LOVE YOU more than a gift certificate to Esthetic MD Medspa. We have something for everyone. Deep Tissue massage with hot towels for him, and Rejuvenating Facials and Jane Iredale Skincare Makeup for her. FREE Equadorian Dark Chocolessence Bar infused with hints of citrus or spice when you purchase a Gift Certificate for $80 or more. A treat for your sweets! FREE Swedish Massage with the purchase of the amazing Intuitiv Firming & Lifting Facial for $160 - this organic facial uses rare organic plant materials with super antioxidants to give you an immediate lift. BOTOX is only $10.50/unit while supplies last!!!! Call now to make an appointment 985-641-5476. Love the skin you're in!